NEW! 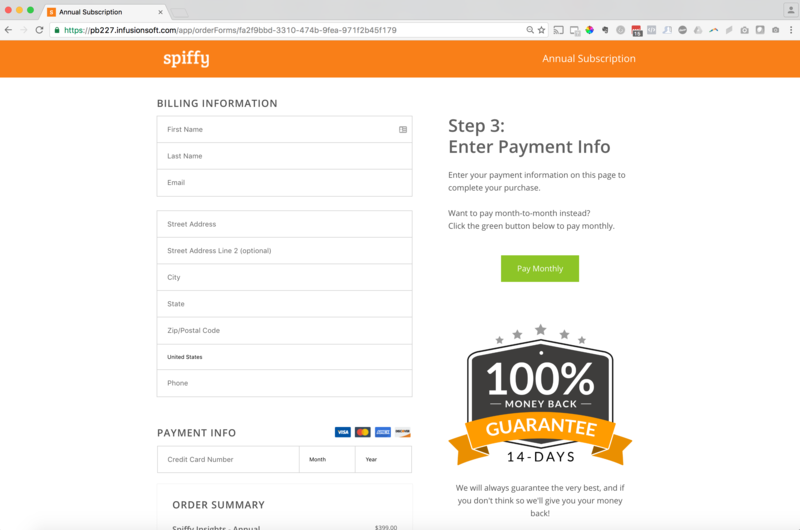 Spiffy Ecommerce now optimizes the Infusionsoft shopping cart checkout process. Click here to learn more. 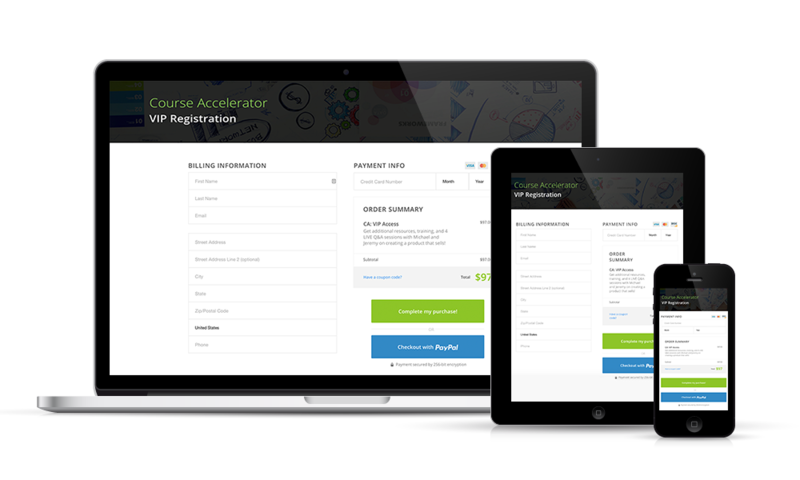 Transform your Infusionsoft order forms into beautiful, mobile-friendly sales machines in under 55 seconds! Over 50% of all purchases made online are coming from mobile devices. Making order forms easier to use on the devices your customers are using to browse and purchase from your website will drastically improve your sales. Infusionsoft’s order forms are not mobile-optimized out of the box, but we’ll handle that for you! Over 50% of all ecommerce traffic comes from mobile devices. This number will only increase as mobile technologies get even smarter, faster and in the hands of more people around the world. One out of three of all ecommerce purchases are made from a mobile device. A seamless purchase experience on a mobile device is an expectation of the marketplace today. Up to 75% of emails are opened from a mobile device first. Email marketing is responsible for a significant percentage of online purchases, making the mobile-friendly order forms a must! See a live example of this Infusionsoft order form with Spiffy, click here. The days of ugly, non-mobile-optimized, un-customizable Infusionsoft order forms are FINALLY OVER! 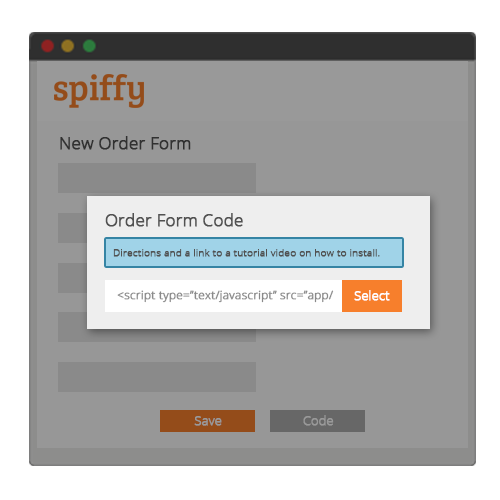 Spiffy is THE EASIEST way for ANYONE to create beautiful, conversion-optimized, mobile-friendly order forms. Copy-paste, drag-and-drop simple, Spiffy rocks! There’s a reason why some of the world’s biggest, and best online marketers are using Spiffy to power their Infusionsoft order forms. Get your Spiffy account today risk-free with our 30-day money-back guarantee! Spiffy’s modern & responsive design makes your Infusionsoft order forms look great, no matter what device your customers use to purchase. Mobile, tablet, desktop – Check! Your Spiffy account is linked to your Infusionsoft application. 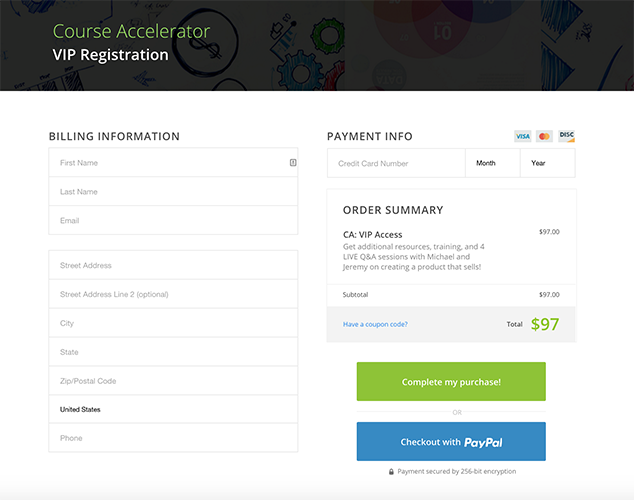 You can create an unlimited number of order forms from a single Infusionsoft account. 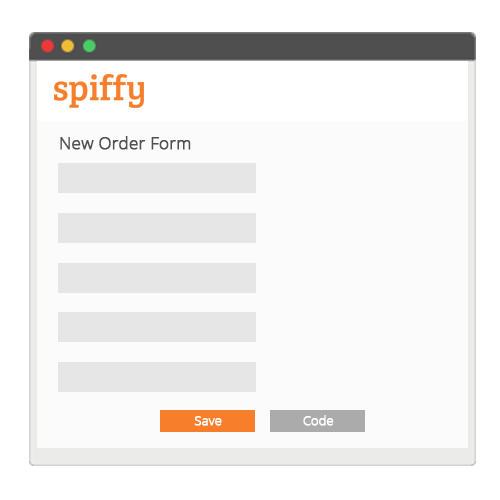 Spiffy works with the order forms you’ve already created. No need to create a new form and hassle with reconnecting all of your marketing emails and sales pages. Spiffy makes your existing order forms look brand new, in 55-seconds or less! 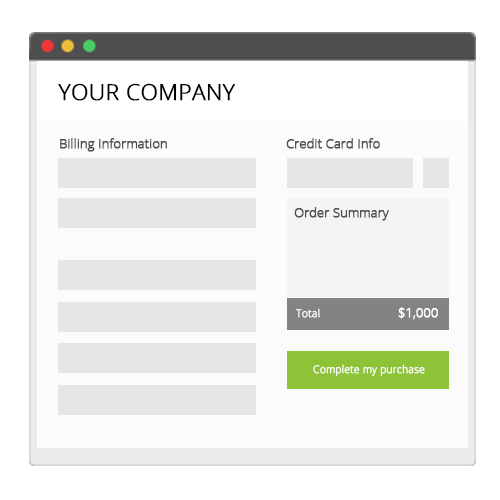 No more expensive bills from developers and programmers for one-off customized order forms. We’ll save you time and do all the heavy lifting for you, every month, for less than one hour of a programmer’s time. Creating your Spiffy order forms is super simple. We have tutorial videos that show you how to install your Spiffy forms. Once installed, changes to forms will automatically update without having to touch any code! Magic. Get Setup in 55 Seconds or Less! Creating your Spiffy order forms is super simple. Login to your Spiffy account, create a new form, and specify a handful of settings. Installing Spiffy is easy. Copy and paste a single line of code into infusionsoft. No crazy integrations, no API madness, and no developers needed. 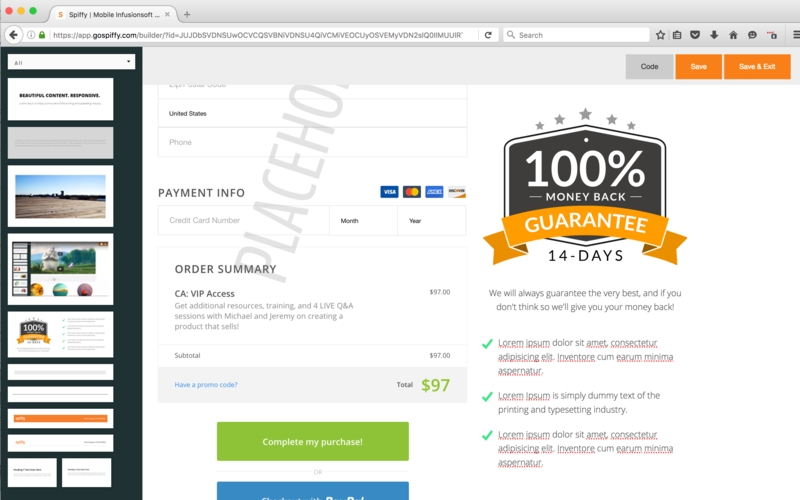 Your order forms are now conversion-optimized for mobile phones, tablets, laptops and desktops! Sit back and let Spiffy do all the hard work. Watch our quick demo video showing how easy it is to create and install a Spiffy order form in less than 55 seconds! Enter your name and email below, and buckle your seat belt. Let’s go!